Be trained by former 3 time Ms. Universe at Energy Gym in Delaware. Also 43 year old mother of two, ages 3 & 5. Lets face it, not everyone wants to look like this. I myself agree. But what I try to explain to everyone who is afraid of being 'TOO MUSCULAR" is that Bodybuilding is extreme - not too many individuals will have the determination, intensity and genetics to achieve a physique that wins bodybuilding titles. Women are bound to their genetic potential and women do not have the hormonal levels to build masculine muscle. The unbeleivable amount of effort and sacrifice in bodybuilding is probably uncomprehensible to most. But just for a minute I want you to imagine the possibilities if you applied basic bodybuilding principles to an average person with average goals and average willpower! The result....progress!!! You won't have bulging muscles, popping veins or 5% bodyfat over night, It just doesn't happen so easily. And I assure that everyone who is trying to achieve a fitness goal or change their body composition with success, will eventually practice a scaled-down version of bodybuilding. Now imagine someone who is in control of their metabolism, can make educated choices, and has the energy to conqueur daily activities with vigor. This is someone who has acheived theirgoal and has learned tomaintain the level of fitness that makes them comfortable with themself. This is the point that most individuals want to be. Everyone has it within themself to find a set point where you look as good as you feel, and feel as good as you look. For some, reaching this point takes longer than others. But no matter what, you need theeducation and knowledge of how the body works. How it eats, how it sleeps, how it grows and how it expells energy. I have no secret tricks up my sleeve. You must bring to the table drive, determination and committment. The tools to use that mental readiness effectively must come from a trainer who has been there and done that. FYI. For those who want to ask but are too shy....The majority of contests that I competed in in the the past were DRUG TESTED - ALL NATURAL shows. There was no use of anabolic steriods or sport enhancing drugs. On the bodybuilding stage I was considered SMALL I just knew how to diet correctly and could "dial-in" for contest day. 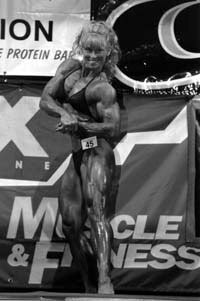 I suggest http://www.femalemuscle.com/ for many more female bodybuilders, fitness competitors and physique contests.